Because of the black propaganda flying around that stinks of “gutter politics,” we are compelled to say what we know about Bongbong Marcos from our own personal experience from being his friend and having spent a lot of time with him over the last forty years. During the years when his father ruled the country, with an iron fist some would say, he was, arguably, the most privileged stripling, lad, and later on young adult in the Philippines who could have behaved or rather, misbehaved, in a way many sons of politicians did prior to Martial Law and got away with it. It was not uncommon to hear stories about the son of this Congressman, or that Senator, Mayor, or cabinet member, get into shootouts that end up with deaths because they felt they were above the law and could break them and get away with it, unpunished, by using their parent’s political clout. And they did! But in all the years that his father was President, BBM was never involved in such incidents even if he had the backing of “superior fire power” (Presidential Security Guards), literally, and political muscle over anyone. The only time he would use his gun was in a firing range where he would practice or compete in “combat shooting” and actually win some of the trophies in fair and open competition, if we may add. We’ve heard some weird stories portraying him to be a pugnacious brat “spoiling for a fight” character that are complete fabrications, and farthest from the truth. Even as a teenager where a mix of testosterone, peer pressure, and “Filipino-machismo culture” can easily degenerate into a belligerent stance and flaunting of power, he never succumbed to behaving similarly as often happened and still happens with “spoiled” sons of powerful families in this country. As for this “dictatorship” balderdash, BBM by nature was and is the antithesis of a dictator — tolerant of beliefs that do not jive with his, and respectful of opinions that contradict his own. But he also expects to be given the same kind of respect when having an opposing view and can and will stick to it firmly, until convinced otherwise. It is no surprise that London and New York are among his favorite large size cities outside the Philippines — the two most “tolerant” social environments in the world where the widest range of diverse people live side by side. So, those that raise the bugaboo of a dictatorship alluding to him are mentally dishonest at best. They take cheap shots at him that stem from their own personal agendas that have nothing to do with his personal inclinations or political beliefs. They send their professional hecklers to his rallies to try to prevent him from speaking freely and unhampered and they even go the extent of cutting the electric power to stop him from being heard by the people until the crowd themselves drive them away. So, who is the dictator? BBM’s run for the Vice Presidency, unlike most others, is not anchored on a consuming passion, much less, an obsession for power — “been there and done that,” so to speak. He’s had enough of “power” to last him two lifetimes. In more intimate and candid conversations with him, one immediately sees that he views the job he seeks as one that carries tremendous responsibilities but exciting challenges and opportunities for him to “make a difference” and provide leadership in the task of nation building. And he definitely is prepared for it because “sigurista” sya eh. Hindi nya papasukan yan kung hindi sya handa mag silbi ng higit pa sa maayos at may kakayahan. Ganyan ang ugali nya — always looking for better ways of doing things. He will bring to the Executive Branch of Government a “strive for excellence” culture. There is no secret to his surge in the surveys and the large and enthusiastic crowds and the warm receptions that greet him in all the places he has visited to ask people to support his candidacy. From the onset, he announced that he would conduct his campaign in a manner that is dignified and deserving of the voters, and would refrain from indulging in “gutter campaign.” He has kept his word and the people have taken notice, unlike other politicians that say one thing but do another. His consistency, sincerity, and doable platform of government are the reasons why he continues to gain support nationwide specially among the youth in spite of a concerted effort to thwart his candidacy by small but powerful groups that continue to “live in the past,” a past marred by three decades of unbridled corruption, continuous blaming, media brainwashing, and hate campaigns that foster divisiveness that have taken this country nowhere. As for the ludicrous demand that he apologize for the declaration of Martial Law half a century ago when he was in his mid-teens, this comes as plain stupidity to most people. But what puzzles and angers the voters is why there is no similar outrage against violations of human rights committed after Marcos these last 30 years. There also has been no condemnation of the present administration’s human rights record as Noynoy Aquino’s six year term comes to an end; the International watchdog group, Human Rights Watch, has simply called President Aquino’s record “a failure.” They added that “there has been no real progress on justice for serious abuses committed under the Aquino administration.” Pray, tell, what happened to the anger and outrage the anti-Marcos leftist groups are good at mimicking when speaking of human rights violations but only during Martial Law? They are selective in who to condemn which, besides being hypocritical, is terribly unfortunate for, and cruel to, the victims of atrocities such as the Mendiola massacre, Hacienda Luisita massacre, the Ampatuan bloodbath, all human rights victims in the last 30 years, and just very recently, the farmers that were killed in the Kidapawan demonstration just the other day when police open fired at them. Even the fact of our country becoming, according to CNN, “the most dangerous place not at war to live in for a journalist” has NOT caused alarm among these pseudo freedom fighters, known affiliates of the Communist Party of the Philippines and its armed group, the National People’s Army. Since groups like CARMMA, SELDA, etc. have not made a dent on his current popularity, they have, just recently, charged him with plunder involving Napoles but that, too, is an old issue that’s already been resolved when Napoles herself said under oath that they had no dealings whatsoever and has never even met BBM and signatures in documents involved were said to have been forged. It is expected that “gutter campaigning” of the worst kind will intensify in the coming weeks and fabricated stories will abound as they already have. We can expect the “usual suspects,” ABS-CBN, the Philippines Daily Inquirer, Rappler and other media outlets “campaigning” for their own “manok” to go all out and vilify him specially because he is now occupying the number one position in all the surveys. BBM or “Bonget” as he is fondly called by his friends, has had an extra-ordinary life, with its ups and downs to be sure, but has proven himself capable of handling the peak and the nadir both with equal equanimity, and the victories and the defeats with composure. Growing up as the “son of the President” during his entire teenage life until his late twenties, we did not witness any abuse of power when he could have done so and gotten away with it. We were also with him at his lowest during his days in exile and saw how he coped with it remakably well in spite of the abrupt — overnight, literally — and drastic change in lifestyle and social standing from no less than son of Head of State for more than two decades to political and social pariah and virtual prisoner in a foreign land as well as persona non grata in his own country; he even managed to retain his sense of humor whereas others with much less of a drastic and sudden change in “fortune and circumstance” would suffer “psychological and emotional breakdowns.” And because “it didn’t kill him, it could only have made him stronger,” as the adage goes; and, indeed, it has made him stronger. We have seen how his patriotism has become even firmer from what was already deep-seated when we first met him forty years ago. We have also witnessed how he has been a good son, husband, and father, too. He is, without a doubt, the best choice for the office and we are certain he will make a good Vice President at the very least, probably better. We wish him success in his latest journey, as a friend, and more importantly, for the good of the country. In a future era of more evolved human beings hundreds of years from now, this could even be relegated to an anecdote in our history which would be a sub-story in the history of man. Without meaning to put a damper on what is already a lame celebration of EDSA 1, this week’s related activities will definitely be politically motivated which is to be expected with elections just around the corner. But the problem is there will be several mini celebrations of various groups and persons bitterly fighting and campaigning against each other, all claiming to be the legitimate “owner” of “EDSA 1” with whatever value there is left in it as a brand. That these personalities, who once marched together in locked arms against Marcos, are now bitterly fighting each other tooth and nail, only confirms that self-interest had always been their motive. These were hidden in lofty ideas and slogans shouted over megaphones when they joined together against one man hoping to partake of the spoils should they finally succeed. It has been thirty years since the uprising which is more than enough time to have made significant gains as China, Malaysia, Vietnam, Indonesia and Singapore did but, alas, we seem to have gotten stuck and even regressed in some areas of nation building. The most obvious is the failure to alleviate poverty and worse, the rise in the number of people experiencing hunger. In education, compared to the time of Marcos, a smaller percentage of our population are presently enrolled in our primary and secondary schools and the ratio of teacher to students has worsened. We have witnessed wanton degradation of our land, forests, mountains, water and air over three decades and our cities have become urban jungles of the worst kind with its accompanying criminality. Our international airport has been named the worst in the world, MRT-LRT are decrepit, and traffic in Metro Manila has become a monstrosity.The drug menace is now a scourge with the narco state, already in place. The shabu trade has reached 1 Billion Pesos a day and continues to flourish. Though our economic growth rate is doing splendidly, sadly, it is only felt by a few, far from being inclusive. According to the Philippine Statistics Authority’s 2014 Annual Poverty Indicators Survey, poverty incidence among Filipinos rose to 25.8% from 24.6% in 2013. But since 2006, poverty has almost remained constant. Finally, corruption has escalated, our people remain divided, the country has become the “most dangerous place to live in for a journalist,” and the International Human Rights Watchdog has just given President Aquino a failing grade. What then is there to celebrate? Unless you belong to the few that have become richer or the oligarchy that is back in power, there is little to celebrate and plenty to lament. through the EDSA “masquerade” and its failure to deliver on promises of a better future for the majority of the people, and the “revolution” that was supposed to usher in deep reforms in government, they will soon change their minds when they witness Senator Bongbong Marcos raise his right hand to be sworn in as the next Vice President of the Philippines. In the 2004 presidential elections contested by GMA and FPJ, there were approximately 4.5M Filipinos with access to the internet while Friendster was the primary social network. In the 2010 elections for President that saw PNoy win the Presidency, Friendster was no longer the top social network and was in fact on its way to extinction; Facebook had dislodged it from “numero uno” position and established itself as the social network darling of all 22 million on-line Filipinos; and a fivefold jump in internet users from the last national elections of 2004 was realized. By then, Facebook, amazingly, had users in excess of more than half a billion people worldwide with close to a billion and a half subscribed users by the start of 2016. By the time the 2016 elections would be underway, the number of social network accounts in the Philippines would have more than doubled the 2010 figures bringing it to approximately 45.7M Filipinos, the same number accessing the internet with a hundred percent penetration on Facebook, hence, the Philippine’s distinction of being called “the Facebook capital of the world.” The coming elections, indeed, could very well be decided on Facebook and Twitter knowing also that all news and entertainment programs and political talk shows broadcast on TV are themselves reporting the goings-on in Facebook and Twitter. TV programs interact with netizens in “real time” giving internet posts a “double exposure” when broadcast as news on TV, or through the TV programs’ respective interactive features. Country Presidents and Prime Ministers, heads of organized religions including Pope Francis and the Dalai Lama, billionaires and celebrities such as Bill Gates and Richard Branson, all use one or another of the social networks to communicate with their constituents, fans, followers and supporters on matters of import as well as their personal feelings on certain issues. During one of the numerous sporadic flare-ups between Palestinians and Israelis, Twitter was used to warn Israeli citizens which district the next missile fired from Palestinian territory would most likely land on — this, in “real time” giving the people in a targeted area time to take cover. The “Arab Spring” in Tunisia, Libya, and Egypt, terrorist attacks by Muslim extremists, embarrassing and glorious moments of international celebrities, as well as multi-million dollar fund raisers, have utilized the various social network portals for optimum effectivity. On the hardware side of the digital social network phenomenon is the trend towards the use of mobile gadgets in accessing the internet. These gadgets — tablets, notebooks, smart phones, etc. — mobile and smaller than the “endangered specie” desktop computers, are more affordable and have helped grow faster the number of people with access to the internet. These gadgets have also increased the over-all average frequency in internet use with apps like traffic advisories, road map directions, restaurant locations, reservations, video games, VoIP telephony, and other information exchanges that help in our daily activities. Next coming is “the internet of things” but we’ll avoid digressing. The situation in the Philippines is no different from the rest of the world albeit behind some countries in penetration but, also, ahead of others. The coming elections in May 2016 will be a “first” for the country to be held with half of the population having access to the internet in spite of our very slow internet speed connection which is another story. As we have witnessed the power of the internet as manifested in other areas of the globe, we may see here in the Philippines — no less than the “Facebook capital of the world” — the results of the May 2016 national elections influenced to a large degree by the digital social networks such as Facebook and Twitter. Be that as it may, we expect the internet to play a major role in the coming elections. The “numbers” are definitely present for it to have a strong impact on the outcome. And in close races, the politician with the better use of the internet could end up the winner because of it. Politicians that don’t give it its’ due importance could be in for the biggest surprise of their political lives. President Aquino’s “Anti-Corruption” Siblings to Back Binay in 2016? IF Pnoy and his Liberal Party adopt and openly support Vice President Binay in the coming 2016 Presidential elections, then the Veep’s chances of winning could go from the 90% (our guess) that it is today, to “101%” in 2016. That would have to mean Secretary Mar Roxas will not be running. This is of course barring any unforeseen events occurring from now until election day such as, say, serious health issues visiting the VP or something nobody has an inkling as of yet and so will surprise us all if and when it happens. His health and age are factors because he is, after all, a septuagenarian plus the persistent rumor of his suffering from some kidney ailment does not help. Still, most concede that Mar is in for a bigger defeat should he challenge Binay to a rematch, this time for the highest position of the land — the presidency. Mar doesn’t see defeat in the horizon and still maintains he defeated Binay for Vice President but was cheated, hence, the electoral protest still pending. President Aquino has been criticized for being “over loyal” to his “K’s” — kaibigan, kabarkada, kaklase, and kabarilan — and there is truth to that to a great extent. 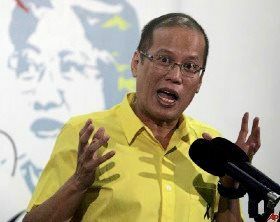 Having said that, who between the two presidential aspirants would PNoy end up supporting? 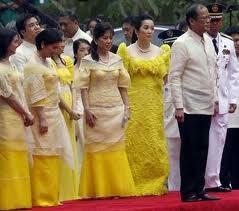 The sisters of PNoy have publicly stated that they have no problem in supporting Binay. That’s still short of actually supporting him. But that’s clearer than anything they have said about Mar’s candidacy in 2016. Also, the Cojuangco side of PNoys family have already made known their support for Binay with Cory’s brother, Peping, leading the way. The President himself has given Mar everything he has asked for, it would seem, and this probably stems from his gratitude to Mar for stepping aside to give him a better shot at the Presidency and it succeeded; but as we all know, there was a hitch — Mar, in the process, lost the “spare tire” position to Binay, an experience as painful as it was unexpected. That may have caused PNoy to feel doubly indebted to Mar; their relationship goes a long way back when you include their families, respectively. Both come from the same elite class of landowners with representation in politics; they attended the same or similar private schools here and abroad; they have mutual Tita’s and Tito’s and family friends; they relate to similar experiences; and they have near identical social and economic backgrounds. 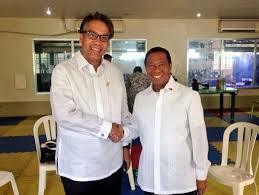 Mar also acted as PNoy’s mentor of sorts in both House(s) of Congress. Binay, on the other hand, was born and raised on the poor side of the tracks. 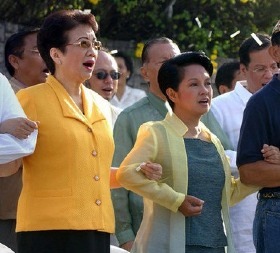 His relationship with PNoy and family began as a political ally of Ninoy, perhaps, not on an equal footing initially, but grew in closeness to them as his political stock increased as Mayor and “chief politician” of the premiere city of the Philippines, Makati, all 28 years since Cory appointed him OIC in 1986. His experience with PNoy’s family has been one of proven loyalty, both one to the other, specially in times of crises such as the numerous coup attempts against the Cory presidency in the late 80’s and whenever either of them was in trouble. The experiences PNoy and Binay share are of a more intense nature and on one occasion during a coup, the rebellion in which Binay took up arms to defend the Palace almost cost PNoy his life. So, there’s more drama and sentimentality that accompanies their friendship while that of PNoy and Mar has to do more with uneventful times in Congress, nothing as sensational except for the time he willingly slid down to the Vice Presidential race to give way to PNoy. 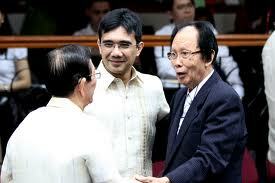 Of course, one could argue that Mar was practically left with no choice but to acquiesce to the “clamor.” So, there…. But party politics dictates that the decision PNoy makes should be in accordance with party (Drillon, Abad, and Mar) preference and in that regard, Mar will have to be the anointed. Considering all that’s been said and done, our take on the coming elections goes like this: the President and the Liberal Party will be supporting Mar while the Aquino sisters and their relatives, in the Cojuangco side at least, will be going all out for Binay — makes one wonder about the sincerity of these folks in their “crusade” against corruption but that’s another story. The so called “yellow brigade” will be split as one can imagine, encouraging the ambition of a 3rd candidate to take advantage of the schism. But regardless of the division among the “yellow”, we don’t see how Binay, so far ahead in the race, can be defeated. Well, maybe in one scenario…which is in the realm of the “possible” but will take a lot of imagination on the part of a 3rd candidate. That scenario is simple and goes like this: a 3rd candidate surfaces who captures the hearts and minds of the youth in a big way as never before seen in this country and whose large number carries him or her on to victory and to the Palace. Imagine a candidate looking almost half the age of Binay at 73 yrs. old and who speaks the lingo of the young in a unforced and natural manner, sings their songs, and appeals to the young girls like a matinee idol. Add to that someone that can articulate clearly the needs and the problems the youth face in their daily lives. Roughly half of the 50 million registered voters in the country are between 18 to 33 years old. Half of that 25M “youth vote” is 12.5M. Let’s just round it off to 10M votes…still, a most formidable solid bloc which, of course, are not the only votes “Mr. 3rd candidate” will be getting in a “solid” way. In addition, he would be the major recipient of the votes of his region, and if he plays it cleverly, the Iglesia ni Cristo solid vote to boot. The numbers speak for themselves: just under half of the youth vote, a solid regional vote, a half-decent showing in the rest of the country plus some help from Mr. Manalo can do the trick. That imaginary candidate will not come from any of those that have been mentioned in media as “presidentiables” — we think none of them can beat Binay, particularly, the ones now tainted with the Pork Barrel scandal. But there have been many surprises in politics, including the last minute unexpected presidential candidate who won in the 2010 elections, and 2016 will have its fair share of it. Until then, this is mere speculation but the numbers remain real. Tourism Secretary Ramon Jimenez Jr. should be ashamed of himself and of his background as advertising man whom we shouldn’t have assumed practices what is known as “truth in advertising.” Mr.Jimenez was widely quoted in today’s dailies as having said that “crossing the 4-million mark is a feat in itself and puts us well on track to achieve our ultimate goal of 10 million visitor arrivals by 2016.” He was referring to the breaching of the 4M mark in number of tourists that visited the country last year. Before we go on, I hope Mr. Jimenez’ pants have been blasted with a fire extinguisher when it must have caught on fire after making that statement. Going back: he called reaching 4 Million tourist arrivals “a feat in itself” which is only eighty thousand more than the number of visitors of the year before or a 2% increase. The actual increase in number of tourists last year from the year before (2011) was a measly 355,357 bringing the total number of visitors to 4.27 million in 2012, up by 9% over the previous year. That fell short of their 4.6 Million target by almost half but that’s not as important as having crossed the 4 Million mark — “a feat in itself,” if we are to fall for the lie contained in Mr. Jimenz’ “advertisment” of his performance for the year 2012. They say one lie leads to another and true enough, he continued to say that though they had failed in achieving their modest goal of 4.6 Million visitors, they were still on track or poised in reaching their far more ambitious goal of 10 Million tourists by 2016 or an increase of about 240% in four years. One would normally think: how can he say that with a straight face and not worry that he may fail dismally in reaching that goal based on his performance so far? Simple. All he feels he needs to do is put a spin on whatever will be the result of his efforts for the next four years and people would buy it as a huge success. There will always be something that could be called “a feat in itself” if one is trained and honed in the advertising industry where truth is irrelevant. Now, we’re beginning to think that Mr. jimenez might convince us that his aim at a goal of 10M tourists by the year 2016 is already “a feat in itself.” It seems achieving that goal is of no significance and totally irrelevant to one’s performance if you think like an ad man. In fact, I would say “odd man” is more like it, at least, in the real world. And crossing the 4 M mark in number of tourist arrivals (eighty thousand more than the year before) is no feat at all unless he meant feet and a smelly one at that. The Senate “had to accept” the Articles of Impeachment and convene as an Impeachment Court for political reasons — the people expected them to do no less — more than for what the Constitution provides which is debatable and another story. That was the “press release” of the Senate. Let’s assume that it was imperative for them to do so, even if the whole world knew the charges were railroaded in the House of Representatives. 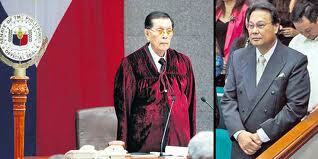 Still, the Senators say, they wanted to show the people that they were not one to shirk from their responsibilities. But why did they not accede to the request of the Defense for a pre-trial to determine probable cause and whether the Articles of Impeachment transmitted to them was without any infirmity and nobody’s rights were violated. That process would have achieved what the people clamored for which was to see that “big people” — a Chief Justice — can be brought to trial and that the “other big people” — the congressmen prosecutors — can also be repudiated if their action proved unconstitutional which it was, and the Articles of Impeachment returned to them for curative measures. There was no “verification” — that it has been read and known to be true — of the charge sheet by the complainants as became obvious on the first days of trial when it became embarrassingly clear it was a fishing expedition they were embarking on. Had there been a pre-trial, all branches of government would have been given their “due respect,” the co-equal branches of government concept would have been strengthened, and justice would have been served and most important, the Bill of Rights and Constitution as ratified by the people themselves, would have been upheld. The House would then have to do things the right way in accordance with the Constitution, verification and due process included, if it wanted to impeach anyone including PNoy. The CJ would have seen that he was not invulnerable to actually getting booted out. The Senators would have been seen doing their job with fairness and lessons would have been learned and institutions strengthened. Problem was, PNoy would have been slighted and the chance for Senators and Congressmen to milk him for whatever it was they needed from the executive, the palace, plus the exposure and opportunity for grandstanding, would have been lost. We’re a miserable country not only economically but politically and culturally, too. And we can’t blame our political leaders only because, sadly, it is us that elected them. Those that say this has been a step forward in political maturity are fooling themselves. “I did not finish Law, but I grew up with a clear view of what is right and what is wrong, of what is pro-people and what is corrupt.” This was part of what the President said in his infamous speech at the opening of the First National Criminal Justice Summit at the Manila Hotel. That he did not finish law nobody will contest that nor did anyone for even one second suspect that he did. If he has a “clear view of what is right and what is wrong, what is pro-people and what is corrupt,” why aren’t we hearing him denounce unfalteringly the three thousand smuggled containers early this year as was widely published a couple of months ago but we no longer hear about? Why does he not use as an example of his pro-people commitment the serving of justice to the victims of the Mendiola and Luisita massacres, both of which, after all these years, have yet to see somebody arraigned in court? Was the obvious haste in the manner the charges were filed against GMA, and the all-time record speed in which the search warrant was served, in the realm of right or of wrong? Is the waste of time in persecuting one individual instead of focusing on bringing the economy forward right or wrong? And finally, was the repeated attempts in circumventing the law time and again since 1968 to cling on to Hacienda Luisita in order to continually “milk it” for the benefit of one family taught to him as being right or as being wrong? And to cite the recent behavior of the President regarding the Marcos burial at the LNMB, it was published early this year that PNoy publicly stated that he was biased on the issue and so would leave the decision to Binay whom he tasked to consult with the various sectors of society and make a recommendation. Binay did just that and gave his report to the President recommending a full state burial but in his hometown province of Ilocos Norte. Again, days, weeks, months went by and suddenly, speaking at the anniversary of FOCAP, the President announced that no way under his watch will Marcos be given state honors and a burial at the LNMB and added that Marcos “master-minded” the sufferings experienced by the human rights victims under Martial law. In short, he went from declaring he was inhibiting himself from the burial issue to making the decision anyway, thus, rendering a decision that by his own admission was biased. So, is it right for him to be making biased decisions as he himself admitted, but wrong for Supreme Court Chief Justice Corona to do the same – assuming the Chief Justice is, indeed, biased? And for the record, all judgements made by Corona on cases involving GMA were made along with the majority and at times, unanimously, but never was it a swing vote. In short, had he inhibited himself in all those GMA cases, the decisions of the court would not have been different. And on the second part of his statement that he is also supposed to know – “what is pro-people and what is corrupt” – does the President share the same criteria and conclusion on the matter with the farmers in Luisita? It would help us all to begin to understand the President’s concept of “right and wrong,” of “pro-people and corrupt,” if he would elucidate us more on these questions and enlighten us with his “clear view” on these issues because judging from what we’ve just mentioned above, the only thing clear about his “clear view” is it is one big contradiction. Perhaps, we should also be asking him when it was that he started to grow up — before or after he supported the “oust ERAP movement” that installed GMA as President? Before or after the DAR under Gloria ordered the scrapping of the “stock option” of the farmers of Hacienda Luisita?